My son Chester is coming up to his 2nd Birthday (in early December) and he’s taken a keen interest in toy cars recently. My dad built me a wooden toy car garage when I was 2 (which I found in the attic the other week) and Chester loves playing with it while visiting Grandpa. This inspired me to carry on in my dad’s footsteps and build Chester his own toy car garage to play with at home. Chester playing with the garage my dad built when I was 2. As long time Nintendo fan and a Mario Kart lover I’ve decide to make him a Mario themed car garage. Chester already has a Mario Kart pull back car that he loves and he sleeps with Koopa Trooper and Yoshi plushies in his cot bed (he calls Mario ‘Maaro’) so I know he’ll appreciate the Mario theme. 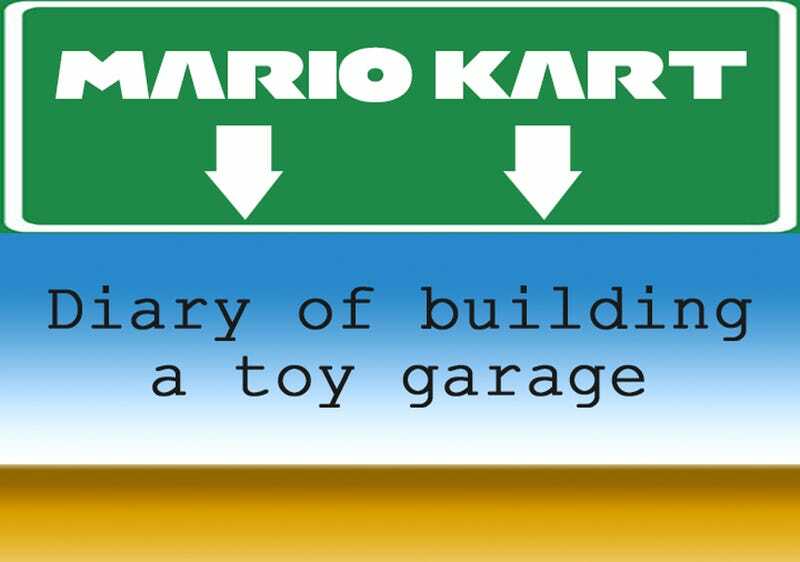 Where better to start a Mario themed car garage project than to look to the greatest Kart game series of all time – Mario Kart! I fired up Mario Kart 8 and started driving around the tracks in time trial mode so I could leisurely browse the scenery looking for inspiration. Some of the cool themed adverts from Mario Kart 8. I found inspiration all over the place in the shape of the cool themed adverts and the wonderfully detailed buildings. One place that really caught my eye is the Mario Motors building on the last corner of Yoshi Circuit (from the Egg Cup which is available in the Zelda DLC). It just so happens that this is one of my favourite tracks AND it originally appeared in the greatest version of the game, Mario Kart: Double Dash!! Mario Motors on Yoshi Circuit. I’ve decide to base the design roughly on the Mario Motors building, using the curved front and the pillars in my design. I’m hoping to include some petrol pumps and versions of the themed adverts in my finished garage as well. Some possible features for the garage. Next step is to make a sketch of my design and start working out the details of the dimensions. Also I’ll carry on taking the scenic route through Mario Kart 8 for visual inspiration!